In this exclusive interview Evans reveals how you too can transform your body into that of a super warrior—without the use of a top-secret serum. In a universe where Norse Gods can summon thunder from the clouds and men can turn into gamma-ray fed hulking monsters with the ability to decimate entire buildings with one punch, how does a normal human being like Steve Rogers manage to stand out? That was the million-dollar question plaguing 32-year-old actor Chris Evans as he began preparing for his latest role as one of the most iconic superheroes of all, Captain America. Bulking up to play Steve Rogers, wasn’t something new for Evans. “Captain America: The Winter Soldier,” marked the third time he’d donned the famous red, white, and blue suit. 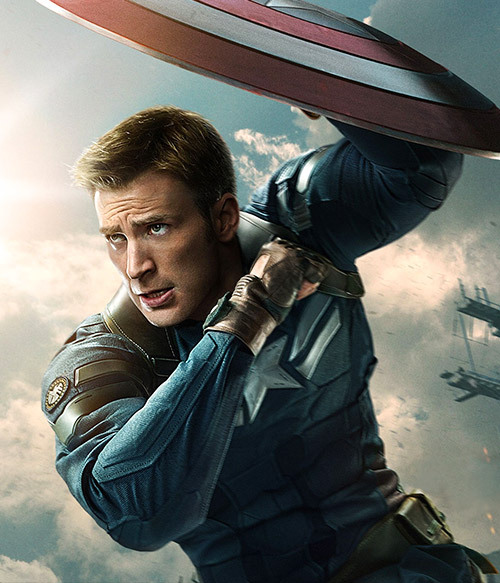 According to Evans, to get the physique of Captain America, a scrawny World War II recruit whose body was transformed by using a government-produced ‘super soldier serum,’ Evans would work on two muscle groups throughout each vigorous session. “It’s a very balanced workout, hitting every single muscle—I think even my toes got bigger, Evans says with a laugh. “We would take two muscle groups, whether it was chest and back or biceps and triceps and we would just destroy those muscles, literally, destroy them for just over two hours. Then we’d cool down with core and abs. He adds: “Monday to Friday we’d hit the different parts of the body. On Saturday, it would be my rest day and then on Sunday, if there was something that needed extra work or wasn’t feeling particularly fatigued, I’d hit that too. However, Evans wasn’t willing to keep his training all that simple. He added gymnastics to his workouts. Add a bunch of plyometric exercises into the mix too and you’ve got one very explosive superhero on your hands. When you think of action movies, most people would presume there’s a lot of fighting, a lot of explosions, and a lot of running away from things. It’s simply part of the parcel. So it was a shock to find out Evans stayed away from too much cardio-specific workouts; it would take away from all the hard work he’d done in terms of building his body up. Instead, he replaced the cardio exercises with circuits. He explains: “Honestly, for Captain America I don’t do a lot of cardio because I’m not trying to lose weight, it’s all about putting on the muscle. It’s big weights and training to put on the muscle. I mean, we might do a few sprints just to make sure I’m loose and conditioned, but that’s about it, to be honest. We’d warm up and do some intervals for 10-15 minutes. “Really though, the cardio training comes from doing the circuits, which are much more effective because you’re working at a much higher heart rate. But you just leave the gym unable to move; it’s really intense. Anybody who knows anything about putting on size knows that lifting heavy objects and spending hour after hour in the gym is only half battle. There’s a lot more to it than just beating your personal best on the bench press. The truth is, you need to put food inside your body to help build lean muscle; and it can’t be any type of food, it has to be the right type for you to reap the rewards you work for. So to add to his back-breaking workouts, Evans also increased the amount of protein he consumed substantially to aid him in his bulking mission. “I had lost weight in between filming “The Avengers” and this, so it was really about bulking up as clean as possible, so I had a high protein diet nutrition to play Captain America. “The equation is around 2 grams protein per kilogram of bodyweight and that’s achieved with a bunch of chicken,” he laughs. “But then I’d also consume other sources of lean protein and some protein shakes through the day. But the eating is the thing I like the least (laughs), because I’d feel full all the time. “I’d eat porridge, walnuts, raisins, low-fat Greek yogurt, a scoop of protein and maybe sliced banana for breakfast, which is generally an hour or two before I work out. Then through the day I’d eat a lot of things with a good protein source, lots of fish and meat. In terms of supplements to complement his workout, Evans used a diverse range to make sure that he was not only building muscle, but also so his body was able to fully recover from the intense gym sessions he would put himself through. “Supplement-wise I used a bit of glutamine, whey protein shakes, branched-chain amino acids, then 500mg supplements of Omega-3, Omega-6 and Omega-9 fatty acids every single meal to make sure that my joints were functioning well—I needed it because the working out was so intensive, especially with things like the gymnastics. “The branched-chain amino acids were basically there to fill the chain of repair of protein. The glutamine was used to stop me going catabolic or burning muscle tissue as energy, and was also good for my immune system. Fancy having a physique like Captain America himself? Here’s a workout schedule that can help you get the superhero physique you so badly want. These sessions are all about packing muscle on to your frame, so you’ll be using heavy weights and low reps on two different muscle areas. Start off with something comfortable, yet challenging. Make sure you give your body the proper fuel it needs to aid you in your quest to look as buff as Chris Evans does in “Captain America: The Winter Diet.” This is a high protein diet so you can keep your muscles fed after an intense workout.